“It is my willâ€¦â€ these are the historical words Emperor Franz Joseph uttered in May 1857 when he decided to join the suburbs of Vienna with the centre of power along the old town fortifications. The green light for starting the construction of the Ringstraße had been given. And then It took 50 years to build the 3 miles of magnificent road and the most beautiful boulevard of the world. When you visit Vienna it is a must to drive at least once around the Ring. 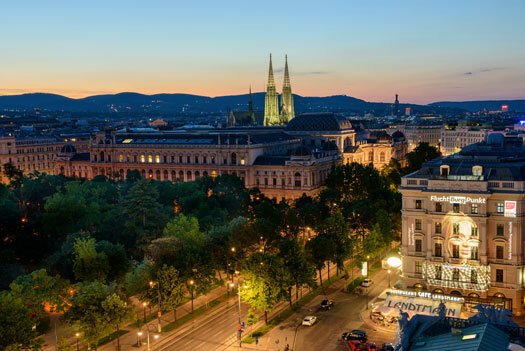 The Ring area has been divided into four zones and houses some of the most beautiful buildings in terms of culture, administration, commerce, finance, and residential sites that Vienna has to offer. Each part of the Ring has its own name: Stubenring, Parkring, Schubertring, Kärntner Ring, Opernring, Burgring, Universitätsring, and Schottenring. At each station of the Ringbahn (train service) you will find at least one significant monument worth looking at: the Museum of applied Art, the Stadtpark, State Opera, the Hofburg Palace and Volksgarten, the Museum of Art History and Museum of Natural History, the Austrian Parliament, the Rathaus (town hall), the Burgtheater, University, and the Stock Exchange of Vienna, as well as a few other buildings such as the imposing Palais Hansen which was built for the World Exhibition 1873, and since 2013, after many changes, is now being used by the hotel chain Kempinski. The responsibility for the appearance of the Ringstraße was only given to the best architects of their time: Theophil von Hansen, Heinrich von Ferstel, Gottfried Semper and Carl von Hasenauer. They not only adhered to historicism, but also made use of styles from previous periods: Renaissance, Baroque, and Gothic – easy to discern for the present eye. The most important monumental buildings stand on their own, usually surrounded by gardens – they were meant to exude greatness and power. 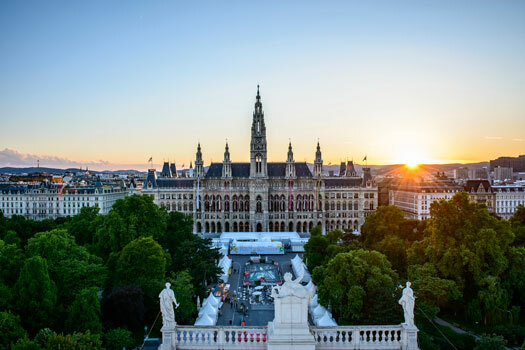 The style was chosen in accordance with the purpose of the buildings – for example, neo-Greek elements were used in the erection of the Parliament, referring to the country of origin of democracy, or the neo-Gothic Town Hall was meant to communicate the magnificence of medieval towns. The Ringstraße is one of Viennaâ€™s most important roads today, as it was then. Here you meet for a walk, avoiding the hectic town centre; numerous good pubs and restaurants have set up here, such as „Said the Butcher to the Cow“, Burgring 1, Motto am Fluss, Hansen, Das Vestibül im Burgtheater, Catinetta am Ring, just to name a few. And you will find any cuisine you could wish for, and, of course, also the wonderful Austrian coffee houses, such as the CafÃ© Landtmann or CafÃ© Prückel. During the anniversary year of 2015 we shall have a closer look at the Ringstraße, capture its beauty at different times and seasons, and tell you the background stories. 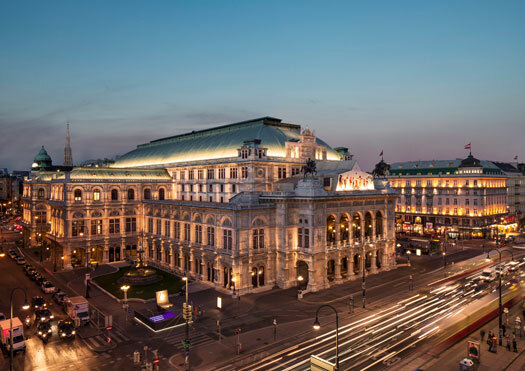 PS: From our hotel you can reach the Burgtheater on foot within 5 to 10 minutes and step into the Ringbahn. "Excellent Hotel, lovely rooms with balcony"